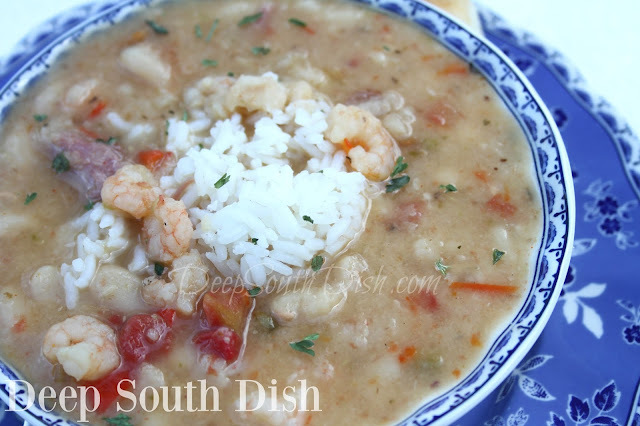 Shrimp and White Bean Stew - Great Northern, cannellini, navy or your favorite small white bean, cooked in a ham bone broth, with the trinity, Rotel tomatoes, andouille sausage and small shrimp. I literally have been trying to get this recipe written and uploaded to the blog for almost two weeks! What can I say... this year I turned 60 y'all, and seeing as I'm mostly retired now, I don't spend too much of my time being in a hurry to do much of anything anymore. You may have also noticed that the Deep South summer-like fall heat finally gave way to some much cooler, near winter-like fall temperatures. Though it's sure been nice having some cooler temps the past couple of weeks, along with that comes a certain degree of laziness on my part. Though I do still cook, not a lot of writing happens. The blog calls for a little attention every once in awhile though! I'm sure I've mentioned this before... but on Sundays, I usually hit the deep freeze, look for what I have accumulated and pull a handful of frozen blocks of stuff that becomes the basis of my cooking for the week. That's the extent of my so-called menu planning! This time my forage included a ham bone that I needed to use and though I usually reserve those for classic red beans and rice, I was more in the mood for white beans this time - which I happened to have in the pantry and also needed to use. I love white beans with smoked sausage, but wow, are they good with the addition of some tiny shrimp, and even better when you can start off with a ham bone or some meaty pork hocks. You can do an all out ham stock, but... did I mention I've been lazy? So I started off with simmering the ham bone in water for at least 45 minutes for my base, then, instead of sauteing the veggies like I usually would, I just added them right to the ham bone broth. Did I mention cold weather makes me feel a little lazy?? No worries if you don't have a bone - you can still make the beans. After you've done the presoak, use chicken broth to boost the flavor. Heck, this is even good made with canned beans. Let's make some! For more of my favorite bean recipes, pop over to my Pinterest page! Presoak beans (see notes below). For the stew, add ham bone or pork hocks to soup pot and cover with water plus another two inches. Bring to a boil, reduce heat and simmer for 45 minutes. Add beans, onion, bell pepper, celery and garlic and bring to a boil. Reduce heat and simmer for 1 hour. Add sausage, seasonings and tomatoes and continue simmering another 30 minutes or more, until mixture begins to thicken. Add shrimp and continue cooking until shrimp is cooked through. Taste and adjust seasonings, adding salt only if needed. Presoak: Sort through beans and rinse. Place into a soup pot and cover with water plus about two inches, soaking overnight, or do a quick soak by bringing to a boil, and boil for 3 minutes uncovered. Turn off heat, cover and let soak for one hour. Drain and set aside until needed. May also use an Instant Pot/electronic pressure cooker. Add the beans, cover with an inch of water and pressure cook on high for 5 minutes. Let the pressure release naturally, then drain and proceed with recipe or store in refrigerator until needed. Cook's Notes: If you don't have a bone or hocks, after the presoak, cook the stew by covering the beans and veggies with enough chicken broth to cover plus two inches; continue with recipe. Use Great Northern, Cannellini, Navy or your favorite small white beans. May also be made with canned white beans, although the time is shortened. I start by sauteing the veggies and sausage first. Drain and rinse beans, adding with seasonings and tomatoes and cooking for about 30 minutes. Check These Other Bean Recipes Out Too Y’all! Wow, Mary! This is soooo good! I had planned on something else entirely for this evening's supper, but as soon as I saw this I HAD to make it and I'm so glad I did! It was excellent, even though I had it started already by the rime I went in the pantry for the beans. What I thought was a bag of Camellia white beans was actually lady cream peas, so that's what I used. Holy cow... They only needed 22 minutes in the Instant Pot. I'm so glad I saw this! I glad you enjoyed it Jan!